A spiral is a linear curve that winds around a centre point with increasing distance to that point although it can be also interpreted the other way round. There are examples of spirals in nature, like the shells of snail. It is a very old symbol and was used all over the world. In a megalithic context spirals were used in rock art, both on rock surfaces and in tombs. Although fewer, there are some examples of spirals on rock surface in the north of Britain, e.g. in Northumberland and Scotland (Achnabreck, Scotland). Spirals have also been found in Valcamonica and on the canary island of La Palma (Fuente de la Zarza) and in Scandinavia (e.g. Bardal, Nord-Trøndelag, Norway). 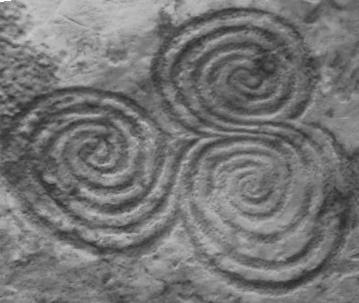 Spirals have been strongly associated with art in megalithic tombs mostly in Ireland. Most famous for spiral motifs are the megalithic tombs of the Boyne valley in Ireland that are extraordinary rich in rock art. Spirals can be found in many forms in the tombs of Knowth, Newgrange and Dowth. The spirals are mainly found here on uprights in various configurations, including double and triple spirals. The tomb of Barclodiad Y Gawes in Angelsey, Wales is an example outside Ireland that shows spirals amongst other motifs including concentric circles, serpentine motifs, chevrons, cup marks and lozenges. The motifs are carved on strategically placed uprights in the inner passage and chamber areas. There is support that for northern cultures the spiral represented the cycle of the sun, the moon and the stars in general. In particular the sun is changing the distance to the earth axis between winter and summer solstice. This results in a kind of a spiral course of the sun relative to the earth. Lewis-Williams and Dowson  relate the spiral to entoptic phenomena and derive its use from their model of a neurologically generated tiered cosmos: The spiral is a often experienced entoptic phenomenon during altered stages of consciousness. These stages were seeked by shamans or ritual experts. It is possible that the megalithic tombs were resembling to a certain degree what the ritual experts experienced during their ‘journey’.